FILE - A former farmer at a primitive refinery makes crude oil into diesel and other products in Syria, April 6, 2018. While Syria's 7-year civil war has had an impact on nearly all aspects of life in the country, it also has provided many Syrians working in the oil sector with new job opportunities. "We work at these oil refineries because there aren't many job opportunities in our region," Nasir Talif, an oil worker in the town of Tirbespi, told VOA. "It's dangerous and unhealthy, but we don't have many choices," he added. Since the beginning of the war in Syria in 2011, nearly half of the country's 22 million people have been displaced. Those who remain face high rates of unemployment. Hamid Maiouf, another oil worker, said "there are many factors leading us to work in this dangerous profession. The war in Syria has impacted the local economy." He told VOA that "working in agriculture is not as profitable anymore because of the drought. That's why you see a lot of people getting into the business of oil refining, despite its risks." Syria's richest oil fields lie in the Kurdish-majority Hasaka province. There are more than 1,300 oil wells across Hasaka. Prior to 2011, daily production of crude oil in the province reached about 22,000 cubic meters, or approximately 150,000 barrels per day, according to Syrian government statistics. 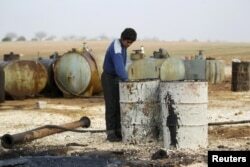 In total, Syria produced about 47,696 cubic meters, or 300,000 barrels per day, before the war. "Working in the oil business is the only source of income for many families around here. So, we can't call for ending this practice," said Saleh Ali, a resident of the province. "We just need to find a way to eliminate the risks involved with it. Our children and environment are heavily affected by this practice." "In the last two months, we received about 675 people who have been diagnosed with diseases resulting from oil refining, such as allergies, respiratory complications," said Hind Osman of the Kurdish Red Crescent. FILE - A youth works at a makeshift oil refinery in Syria, Dec. 16, 2015. "Three months ago, we issued a public notice that all workers at local oil burners must use gas flares that destroy sulfur dioxide, which is a toxic component that pollutes the environment," Tariq Mohammed, an official at the Kurdish-led Environment Commission, told VOA. The Kurdish People's Protection Units (YPG) took control of the region in 2012 after Syrian government troops withdrew to focus on fighting rebels elsewhere in the country. But the war against the Islamic State terror group halted oil transportation from the Kurdish region to the country's two refineries in the Syrian regime-held cities of Banias and Homs. In July, a Kurdish delegation met with Syrian government officials in Damascus to talk about the future of northeast Syria. Oil was one the main topics discussed, according to local media reports.